We’ve all been there before. You’ve written a great blog post, and you’ve plopped a featured image in there to represent the post on social media, your blog’s main page, and so on. Then, you hop on your social media accounts and paste the link into a new post. You’re all ready to share it with your network, but there’s just one problem.Unfortunately, the social networks are pulling the wrong thumbnail image. Or worse, they’re pulling none at all. Not only is this annoying — you were so close to being done — but a bad thumbnail image (or no thumbnail image) could seriously hurt your post’s performance on social. Images are a key play for garnering engagement on your social pages, and data shows they help generate more likes, shares, and comments. For example, tweets that feature an image result in 150% more retweets. But that image needs to be the right image — not your logo, not a cut-off picture of your call-to-action button, and not some other image randomly pulled from the page. So, how do you ensure each of your social networks pulls in the image you want it to? The answer lies with something called the Open Graph Protocol. Open graph is a protocol first created by Facebook in 2010 for extracting the title, images, URL, and meta-information from a webpage and displaying it in a social media post. Today, Facebook, Twitter, and LinkedIn all use open graph protocol to help publishers include more content on the front of their social media posts. When you share a website or an article on Facebook or LinkedIn, or via Twitter Cards, you’ll notice each of these social networks automatically pulls in a few pieces of information into your social post: the website’s title, an image, the URL, and a short description. This is made possible using each social network’s open graph protocol. LinkedIn has since adopted the same protocol Facebook originally developed, while Twitter uses its own open graph system that’s based on the same conventions — although Twitter accommodates the Open Graph protocol if you already have it on your site. Also note that Twitter only automatically pulls in information from a link when you use Twitter Cards — not for regular tweets. Marketers need open graph (OG) protocol if they want to post better-looking content on social media. But where does each social network find that information? That’s where open graph tags come in. When you put OG tags in the head section of a webpage, social networks have a much easier time finding the correct information for each part of the social post. Open graph tags are the specific pieces of information that publishers can insert into their webpages so social networks know which site attributes to pull into the social media post. Some CMS’s include meta tags automatically, while other websites need you to add them manually through the page’s HTML. If your webpage doesn’t have OG tags in the code, they’ll take a guess on where to find the right information. Usually they’ll do OK with the title, URL, and description, but they might have trouble picking the right image. OG image tags tell social networks exactly which image to pull. If you plan to use certain webpages or blog posts in your social media posts, there are few OG tags you’ll include most often in each page: one for the webpage title, one for the image you want displayed, one for the URL of the webpage, and one for a one- to two-sentence meta description that describes the page. Here’s what they all look like below, with placeholder text in all caps denoting where you’d customize the content of each tag to reflect what you want the social media post to display. See that “og: … ” text describing the meta property of each line above? The text that comes after it is the tag category of the OG tag, telling the social network you’re posting to what type of content to look for on your webpage. For example, the first one says “og:title” because this tag dictates the title of the webpage you want to appear at the top of your social media post. Posting a blog article? The OG title tag will probably be the title of your article. “og:image:width” — This OG tag is nested within the image tag, allowing you to define the specific width of your feature image in your social media post. “og:image:height” — This tag is nested within the image tag, allowing you to define the specific height of your feature image. We’ll talk more about recommended image sizes for each social network in the next section. “og:article” — This tag lets the social network know your post is an article, and there are several other tags you can nest inside this one to further promote the article in your social media post. “og:article:author” — This tag is nested within the article tag, allowing you to promote the author (or the byline) of the article in your social media post. “og:audio” — This tag allows you to promote and describe a playable audio file in your social media post. “og:video” — This tag allows you to promote and describe a playable video in your social media post. “og:video:series” — This tag is nested within the video tag, allowing you to promote and define a video series if your video belongs to a larger video campaign. The list goes on for the OG tag categories available to you. Blog, game, city, book, company, hotel, and country are all categories of OG tags you can use to customize your Facebook, Twitter, and LinkedIn posts to best represent the content you’re serving to your audience. Although your images look similar when posted to Facebook, Twitter, and LinkedIn, each social network’s open graph protocol has its own minimum image size requirements. 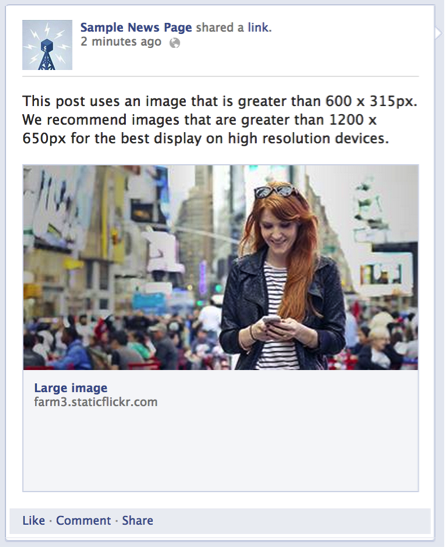 Facebook, for example, recommends using images that are 1200 x 630. If you use WordPress, you’ll need to install this plugin or one like it, but then you’ll be set to go. Ultimately, this post is for you if you don’t use a content management system (CMS), as you’ll need to do it manually for each page on your site. We’ll show you step-by-step instructions for how to manually optimize images for social posting on the top three social networks for sharing content: Facebook, LinkedIn, and Twitter. To ensure Facebook pulls the right image from your blog post into your Facebook posts, you’ll need to first optimize the image size for Facebook and then add the proper OG tags to your website. Required: Facebook requires you to use an image that’s at least 200 x 200 pixels. 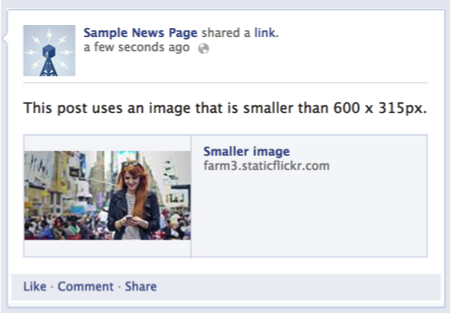 Suggested: Although 200 x 200 is the absolute minimum, Facebook advises using an image that’s at least 600 x 314 pixels. For the best display on high-resolution devices, the company suggests choosing an image that’s at least 1200 x 630 pixels. If your image is smaller than 600 x 314 pixels, it’ll still display in your post, but appear as a thumbnail-sized picture. So, if your images carry a lot of important detail that would be lost in such a small frame, it’s best to set your OG image tags to 1200 x 630. 1. Copy the meta tags below. 2. Replace the placeholder text with your selected image’s URL. Next, remove the sample image URL above, highlighted in red, with the actual URL of your image. Do the same with the height and width numbers, highlighted in green, replacing them with the correct dimensions of your image. Keep in mind Facebook’s image size requirements. 3. Copy the resulting code snippet into the HTML head section of your page. Once you’ve filled in the code in step 1 with your own content’s image URL and dimensions, open the source code (often denoted with this icon: “<>“) and paste it into the top of the page’s HTML. 4. Enter previously shared webpages into Facebook’s Sharing Debugger. If you’ve previously published this webpage without tags, or if you publish the page and then realize you messed the tags up and need to adjust them, you’ll need to run the URL through Facebook’s debugger once you make any changes. This is because Facebook caches its shared pages — so if you don’t refresh the cache, the thumbnail won’t be corrected. To ensure LinkedIn pulls the right image from your post to use as a thumbnail, you’ll need to optimize that image’s size and then add the proper OG tags to your website, much in the same way as you did for Facebook. Required: LinkedIn requires thumbnail images to be at least 80 x 150 pixels but no larger than 80 x 110. If your image doesn’t meet these requirements, LinkedIn will automatically pull in an different image on your page that fits the right dimensions. Recommended: LinkedIn’s sharing module has the ability to promote wide, rectangular images, which can increase your post’s clickthrough rate over a 80 x 150 thumbnail. To share an image like this, the company advises using an image that is 1200 x 627, and as close to a 1:91:1 aspect ratio as you can (i.e. rectangular, rather than square). That’s it! Now, when you post a link to your article to LinkedIn, the Open Graph Protocol will read the OG:image tag and display the image you point it to. You might notice there’s a conflict in the required image sizes if you’re optimizing your webpage for thumbnail images: LinkedIn requires your featured image be no larger than 180 x 110 pixels, while Facebook requires your image be no smaller than 200 x 200 pixels. While you could technically size your featured image as close to 180 x 110 pixels as possible without going over, that would optimize for LinkedIn while resulting in a very small image on Facebook. Remember, although Facebook requires an image size of 200 x 200 pixels or larger, they recommend you don’t go smaller than 600 x 314 pixels so the image in the post is large. To set up Twitter Card tags, you’ll need to optimize your image size and then add the proper Twitter Card tags to your website. Required: Twitter requires your image to be no smaller than 144 x 144 pixels and less than 1 MB in file size. The social network also says it’ll automatically resize images larger than 4096 x 4096 pixels. Recommended: Like LinkedIn, Twitter Cards support large images as well, not just the square-shaped thumbnail. To optimize your images for this open graph, format the image you want featured in your tweet to be no smaller than 300 x 157. Step 2: Replace the example image URL, highlighted in red, with your selected image’s URL. Step 3: Copy and paste the resulting code snippet into the HTML head section of your page. That’s it! Now, when you post a link to your article to Twitter, it’ll properly display your desired image.